Your Angel Card Reading & Channeled Message for the Week of 10/23 – and this one is not to be ignored! Here is your Angel Card Reading & Channeled Message for the week of 10/23. As always, I asked the angels to please bring me a clean and clear reading for you, my clients, students, and followers. For today’s reading they took me right to the Energy Wisdom Oracle Cards by Dina Kennedy (yes, this is the deck I channeled! ), 2 card pull. Ooohhhh this is an interesting heads up for you, and for all of us, here today. 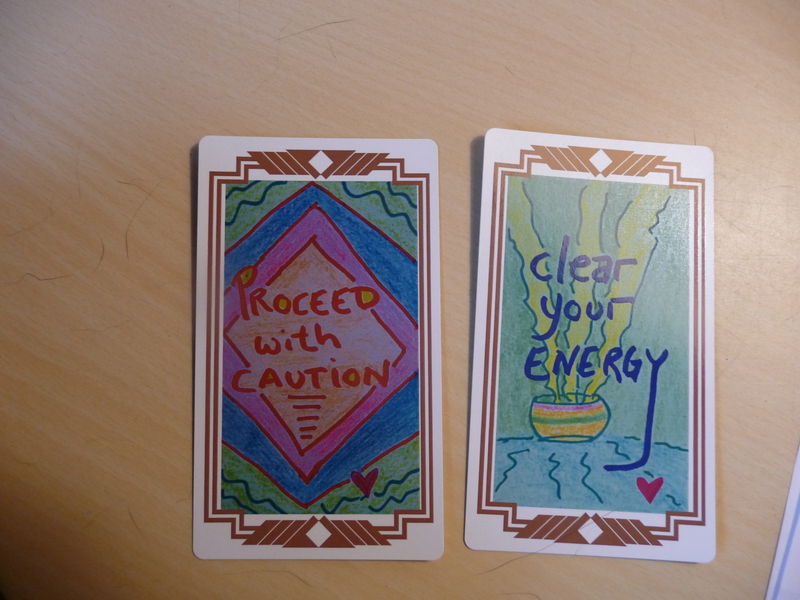 The two cards are PROCEED WITH CAUTION and CLEAR YOUR ENERGY. I immediately get the “hit” that fake news, fake noise, and dirty sticky energies in your home and office (may be a home office or even your car) are running interference in what would formally have been your rational and reasoned thinking and decision making. I am hearing loud and clear that the ever stacking smoke and mirrors, deliberate illusions and their energies being pushed at us daily, and the continual bombardment of energy filled with lies, deceit, dishonesty, and viciousness which are hitting you, and everyone, daily, plus your own shifting/unearthing/bringing towards the surface at a deep level over the last few weeks, have now combined to act as a thick filter through which you are viewing your pending decisions. We are all a part of the eternal web, and as such, there is actually no avoiding these energies as they are now fully embedded in the web. Please don’t think you are exempt. The angels are asking you to PROCEED WITH CAUTION on any decision, because of this filter, which I see as thick and opaque. The angels say that until you can dismantle, or at least cut some openings to see thru in that filter, you are not seeing the situation you are pondering cleanly or clearly. Wow. This is a big warning! The angels would like you to NOT proceed before you CLEAR YOUR ENERGY. I’m hearing 24-48 hours of very deliberate stepping away from news and outside influences PLUS energy clearing of both self and environment is in order asap, dear one. And that this is to be done now, before you move ahead with any important or life shifting decision. Again, this is a very strong reading and isn’t meant to be ignored. Make the time to clear, and to detach, and then come back to this decision you’ve been either faced with or that you’ve been considering. First things first, dear ones, say the angels. And, as always, please call upon your angels (I hear that Archangel Sandalphon would really like to help here) for assistance and further guidance! They are always there for you, you just need to ask.